Stepping below from the centerline entry a comfortable aft cabin with a double bed is to port of the companionway and the head lies to starboard. Forward of the aft cabin is a gourmet U-shaped galley. 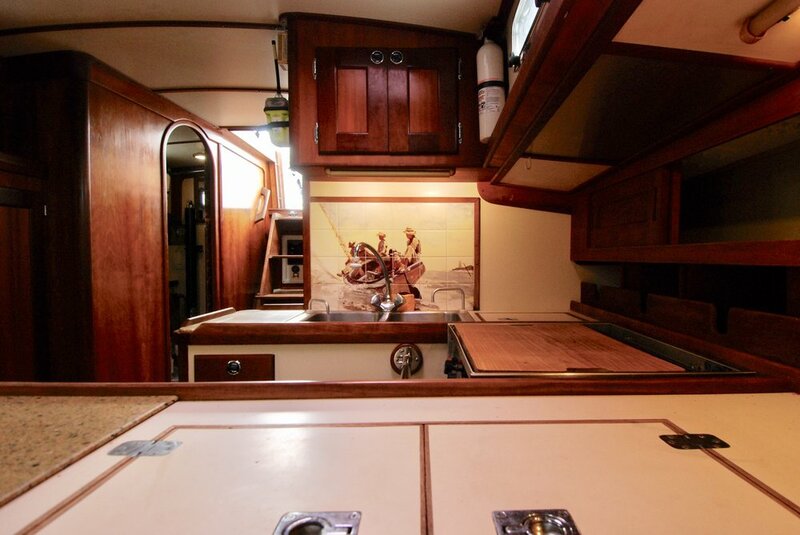 The galley features a copious amount of counter space with custom granite covers, a three-burner gimbaled stove, a large stainless steel double sink, and a top-loading refrigerator. 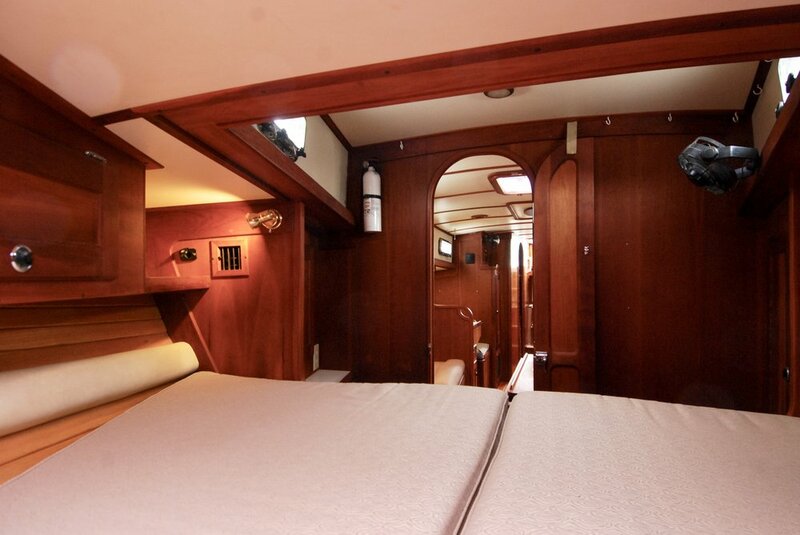 Forward of the galley is a comfortable main salon, perfect for relaxing after an energetic day of sailing. The L-shaped port settee and long starboard settee offer comfortable seating around the folding centerline table. Lee cloths for each settee also offer great sailing berths for long blue-water passages. The folding leaf table comfortably seats 5. Forward of the main salon is a spacious v-berth. 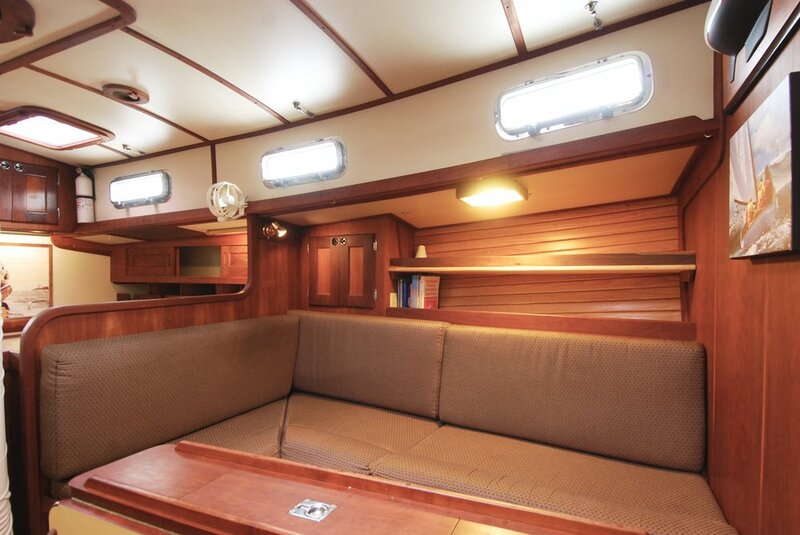 Below decks you’ll find a warm, rich inviting interior space for lounging at the end of a cruising day. There is a large L-shaped settee to port that offers a great space for dining or for kicking back to watch television. There is also a long settee to starboard. 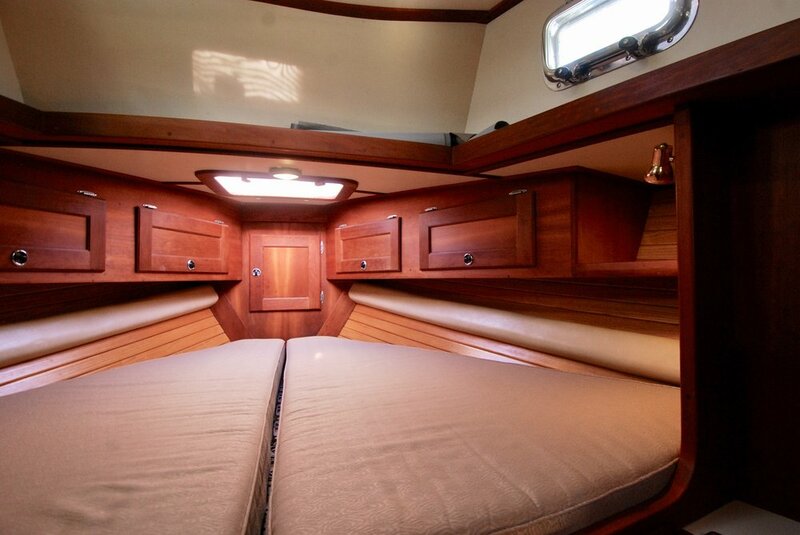 Both settees can be rigged with lee cloths for a cozy sea berth while blue water cruising. There is a centerline folding-leaf table that can comfortably seat 5 for a meal after a fun day of sailing. The main salon also offers seasonal comfort with reverse-cycle air conditioning and heat. 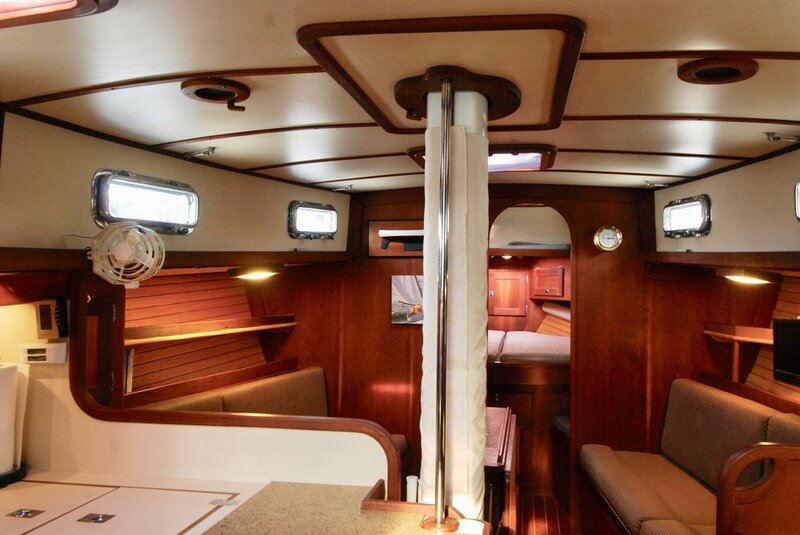 Natural light is provided from stainless steel side ports and overhead opening hatches. Custom shelves and deep storage cabinets behind each settee offer tons of storage along with storage areas behind and below the seating. 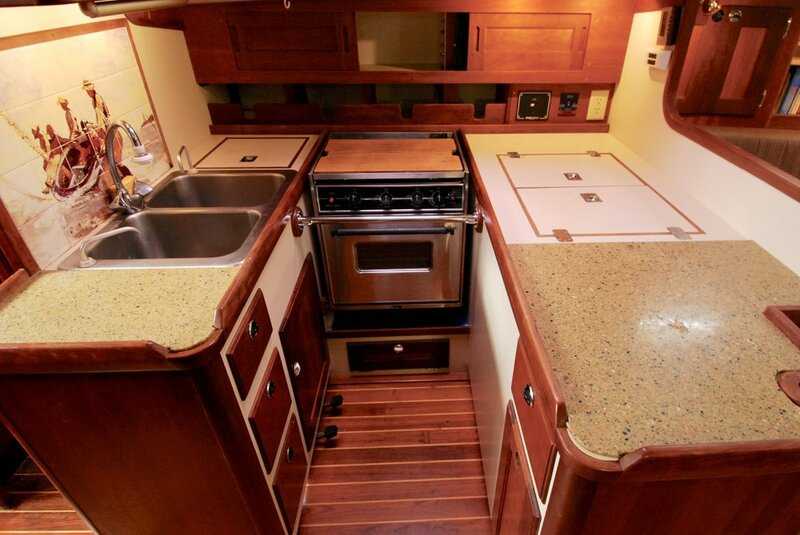 The large gourmet galley greets you to port with tons of counter space and custom granite countertop covers, a top loading fridge and freezer, stainless steel double-bowl sink, 3-burner stove and oven, and lots of storage for long cruises. Chefs always demand counter space on either side of the sink and cooktop and PATTY D delivers. There are plenty of deep storage lockers and lots of refrigerator and freezer space. There is even a designated pull-out cabinet for trash. 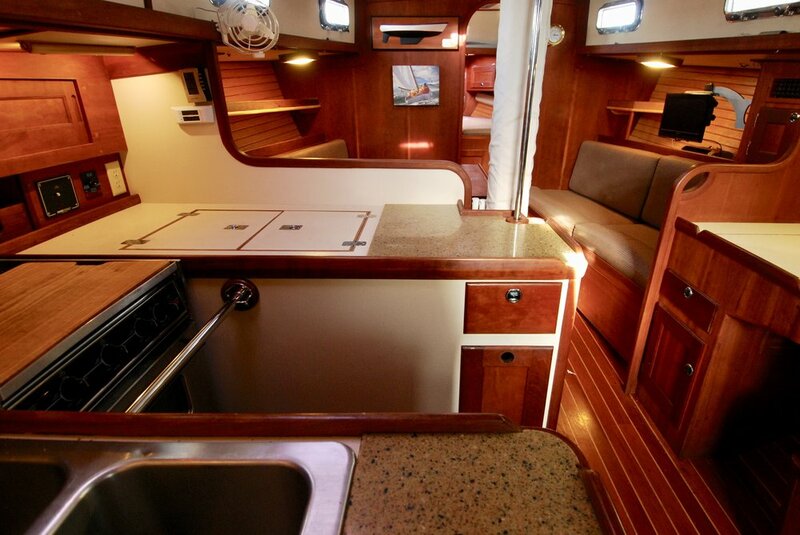 The Valiant 42 CE Queen features a comfortable and spacious owner's cabin with a V-berth queen-sized bed. The marine mattress is made even more comfortable with Froli springs under the marine cushions. 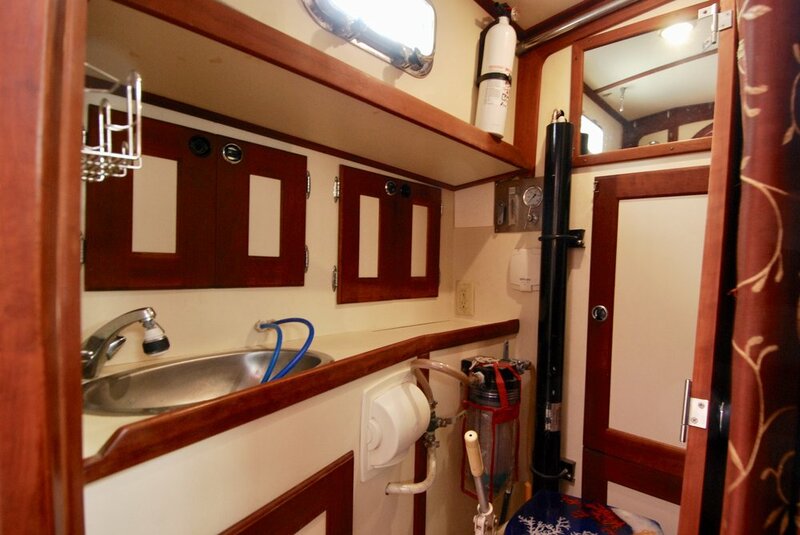 There is an ample amount of storage with drawers below the berth as well as storage lockers to port and starboard. 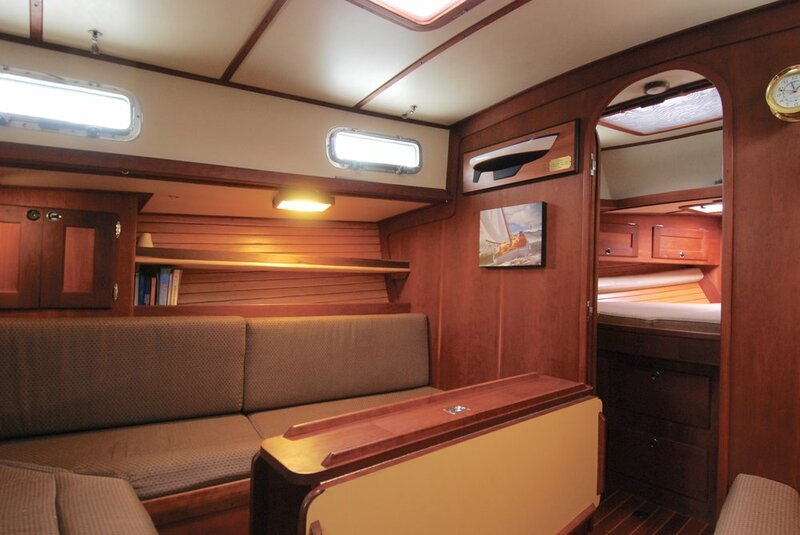 The aft cabin quarter berth is located just inside the companionway hatch, which makes for an excellent sea berth when making long passages because it is just a call away from the helm. 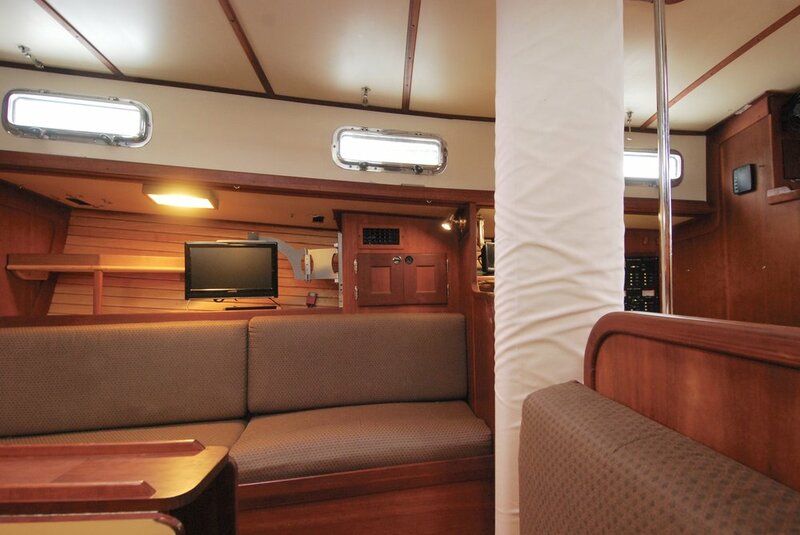 The opening window between the cabin and companionway makes quick communication between the cockpit and this cozy resting area even easier. The head is right where it needs to be - right at the base of the companionway steps for easy access when coming off watch in your foulies. As appropriate for the wet environment, this is a mostly fiberglass space so it’s very easy to keep clean. 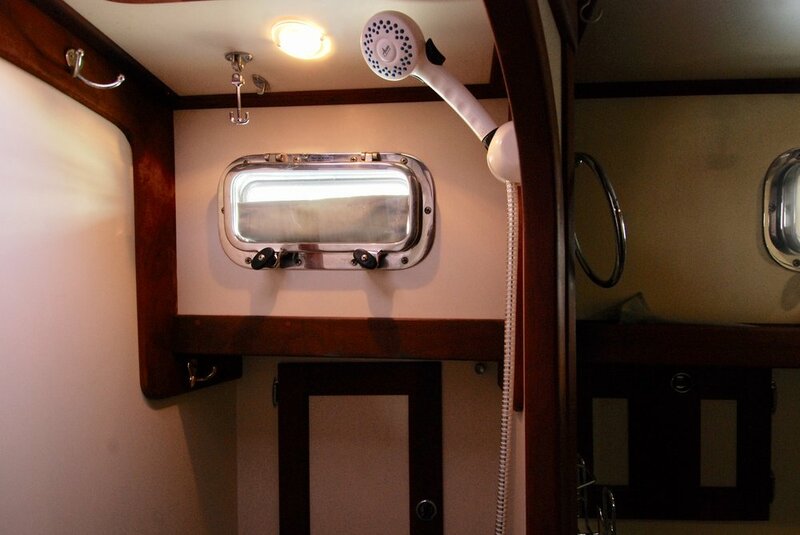 It’s a functional space with large vanity and great ventilation with an opening port and hatch. The head offers great storage below the vanity counter as well as behind the vanity. The cockpit of the Valiant 42 is ready for comfortable lounging and safe sailing in offshore conditions. She is a true blue water cruiser with high cockpit coamings, wide seats, and a solid rail enclosure. The hard dodger and full enclosure offer added protection during rougher weather. 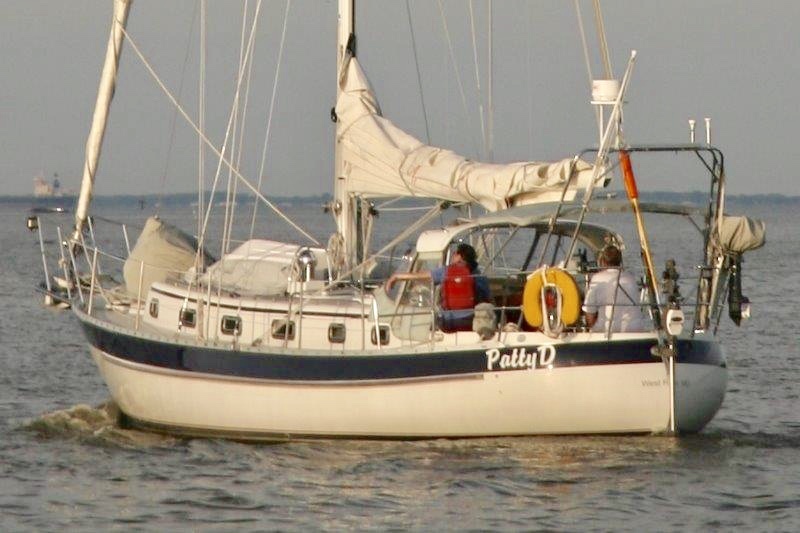 With all of the rigging leading aft, the primary winches within easy reach of the helm, and the Simrad AP24 autopilot, PATTY D can easily be single-handed. The full host of electronics is ready for any adventure with a chart plotter, navigation instruments, and autopilot control at the Edison pedestal along with a full VHF at the starboard cockpit coaming above the engine panel. The high cockpit coamings and wide seats are comfortable and provide plenty of safety. They are long and wide enough to be great for napping and sleeping under the stars on warm summer nights. The folding cockpit table provides a great location for a meal or afternoon snacks. Valiant’s integral design of form, function, safety and comfort make the cockpit an inviting space to spend most of your time on board. Hard dodger with canvas windshield. Boarding gates port & stbd. The Valiant 42 is the evolutionary successor to the Valiant 40, sharing the look and styling of its legendary predecessor. Over the years, the Valiant line of bluewater passage-makers has always reflected a commitment to product evolution and refinement. Valiant began the major shift in the direction of the Valiant 42 with the introduction of the "Series 90" Vacanti keel. Not only does this keel deliver state-of-the-art performance, it also results in a lower center of gravity and provides for a shoal-draft capability, heretofore unavailable without resorting to centerboards and tricky bulb-type protuberances. Significantly, the Valiant 42 deck features a cockpit that is completely wrapped with an offshore coaming for both comfort and safety. Seating areas are fully guttered and an expanded, recessed propane storage system is included as well. 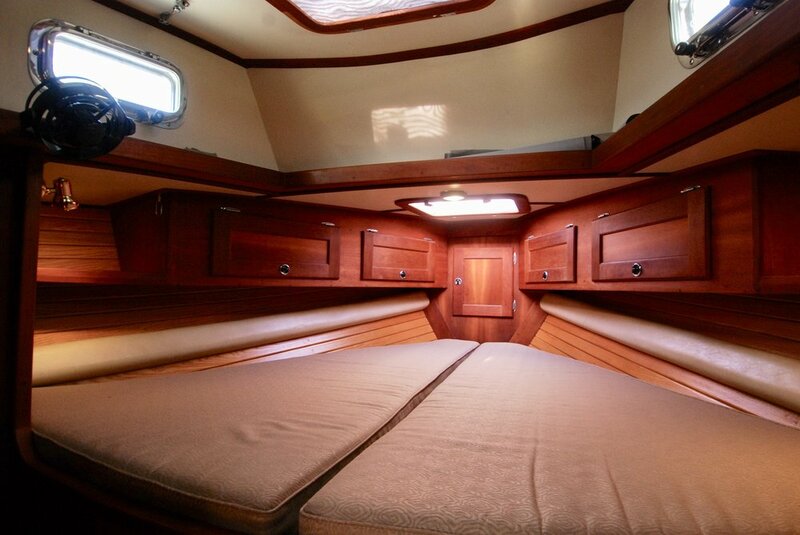 The frontal portion of the cabin trunk is contoured in its transition to the foredeck. The deck design provides for maximum flexibility, while the below-deck volume is increased. There are no predetermined locations for the hatches, portlights and companionway. There are enough variations within the three basic interior arrangements of the Valiant 42 to offer an almost unlimited choice to the customer. 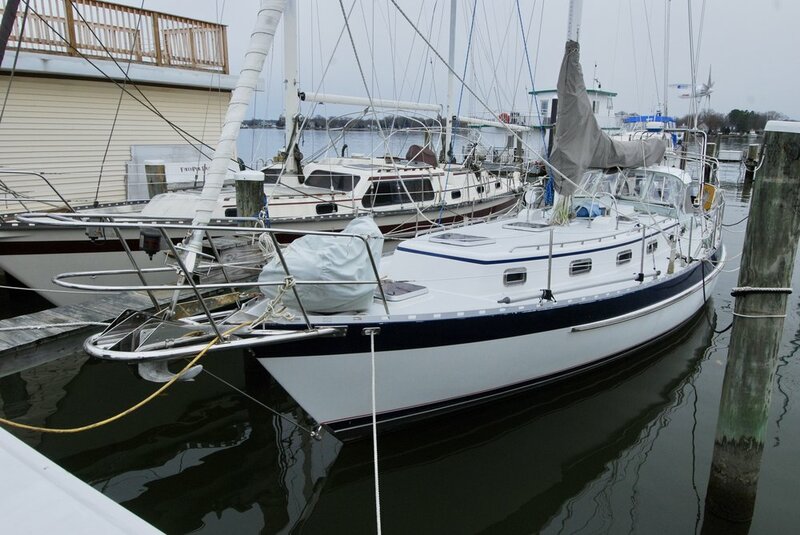 The Valiant 42 features a double spreader rig which is matched with a short bowsprit to maximize sailing efficiency. When we travel with clients FAR out of town for yachts, we don't like surprises when I get there. It's embarrassing for us and can make for an expensive trip. With that in mind, we'd like to share our rating of various systems on the boat so you'll be as informed as possible before you come for a visit. Our rating system is on a 1-10 scale with 10 being 'perfect' (in OUR opinion). Please view this list as a GUIDE only. Everyone's idea of good and bad can vary quite a bit. Our goal in doing this is to help you reach a comfort level with the boat before you invest time and energy to come and see it. We'll summarize by saying that this appears to be an excellent yacht worthy of serious consideration. Beyond telling you what’s great about a yacht, don’t you also want to know what it needs next? Every yacht, no matter how turnkey, needs something. Every owner has next year’s list of ‘to-do’s, right? We’ll also include in this section what Erin and I think the boat could use to take her from nearly perfect to ‘voyage-ready’ for your next adventure. PATTY D is very well maintained and thoughtfully updated. The hull both above and below the waterline is in good shape. The decks are in great shape. 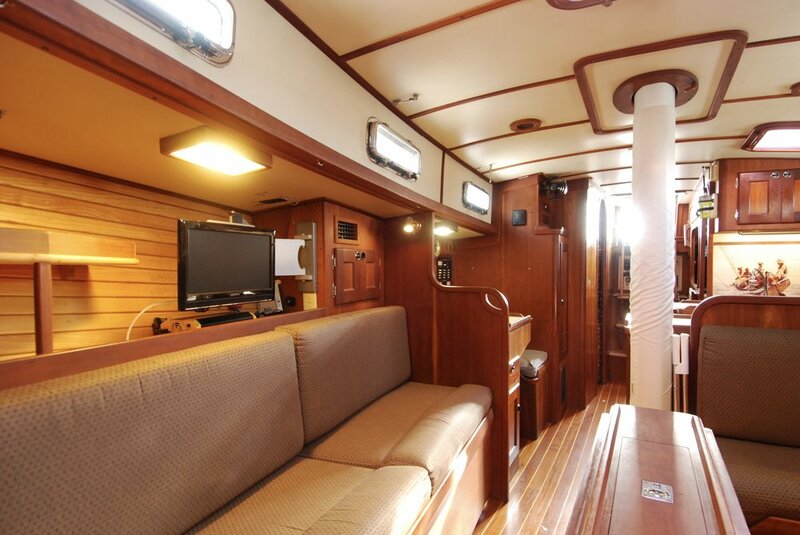 The overall layout of the boat, both above and below decks, is really well configured for long range cruising as well as living aboard. Her cockpit is very comfortable and well protected with high coamings for big of shore seas. Having cruised extensively ourselves, we’re looking for several ‘zones’ of success in a blue water cruising yacht. The most important space is the cockpit and on deck because that’s where we plan to spend the most time. The cockpit on PATTY D is deep and comfortable. The coamings are tall and sturdy for good bracing while healed, providing excellent comfort and safety far out at sea. Movement into and out of the cockpit to the decks or down below is easy even in rough seas. The hatch opening to spaces below is large enough that when you and crew are both above and below decks, you’re well within sight and earshot of each other at all times. The hard dodger provides good sanctuary in messy weather with removable isinglass panels when desired. For entertaining, guests can be both in and out of the boat and still feel together. EVERYTHING you need to manage the boat underway is right at your fingertips or just a step or two away -- critical characteristics for offshore heavy air sailing. Once you leave the cockpit, the decks are nice and wide with tall safety lifelines and plenty of grab rails and structure to use while healed as you traverse the deck. The solid stainless stern rail wraps all the way around the cockpit. 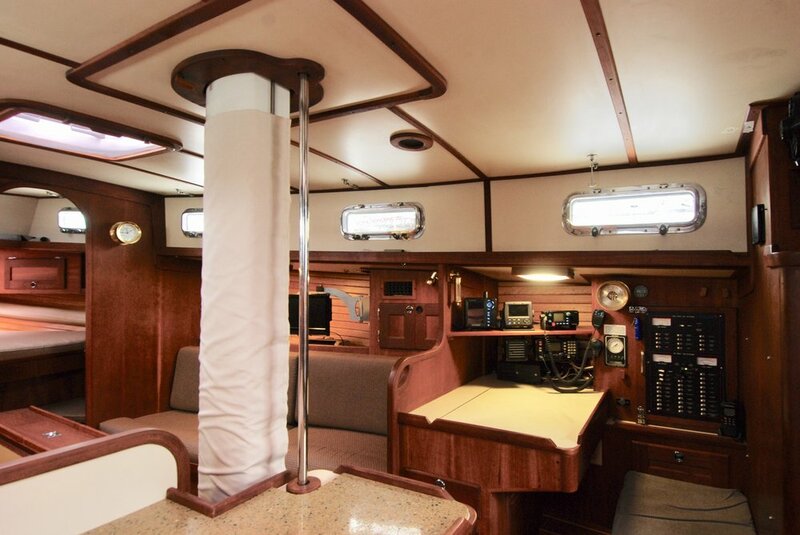 There is easy access to every part of the rig, a nice storage area forward of the mast for the dinghy and life raft, and lots of great places to lounge with a cocktail in hand. 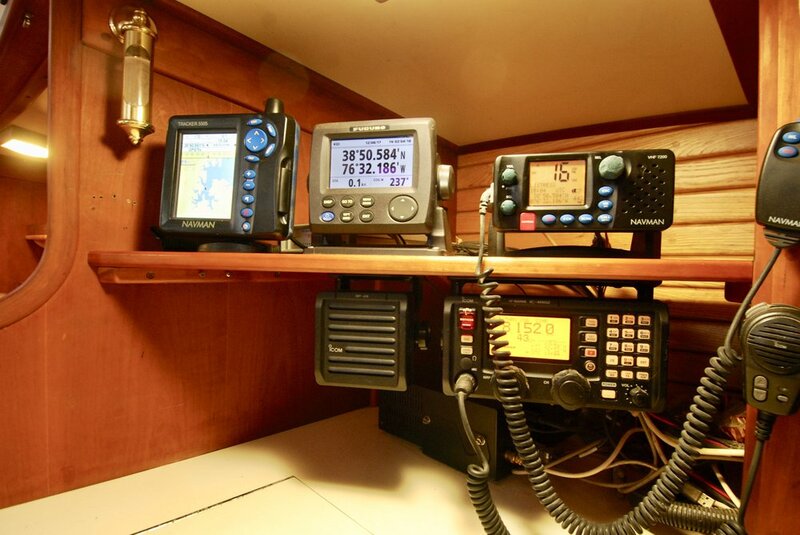 The electronics on this boat are high quality and cover all the bases for serious voyaging. The electrics throughout this boat are superbly designed and executed. Wire chases through the boat logically laid out and completely accessible. There’s plenty of battery power. Updates needed? For long range cruising or sitting on the hook for weeks at a time in the islands, the Eclectic D400 wind machine is the best in the business and makes plenty of power. 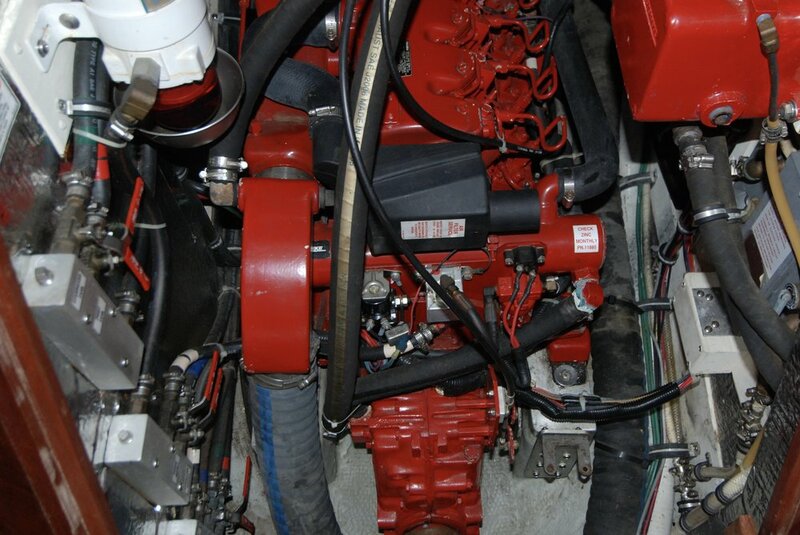 For heavy power needs, the genset compliments the electrical system. This engine is in beautiful shape and well maintained. Her owner prides himself in regular routine maintenance held to an exact schedule. I’m a chef and this is chef’s galley for sure. Great counter space. High quality appliances. Ample fridge and freezer space. Storage compartments and spaces are thoughtfully laid out for maximum efficiency and DEEP. 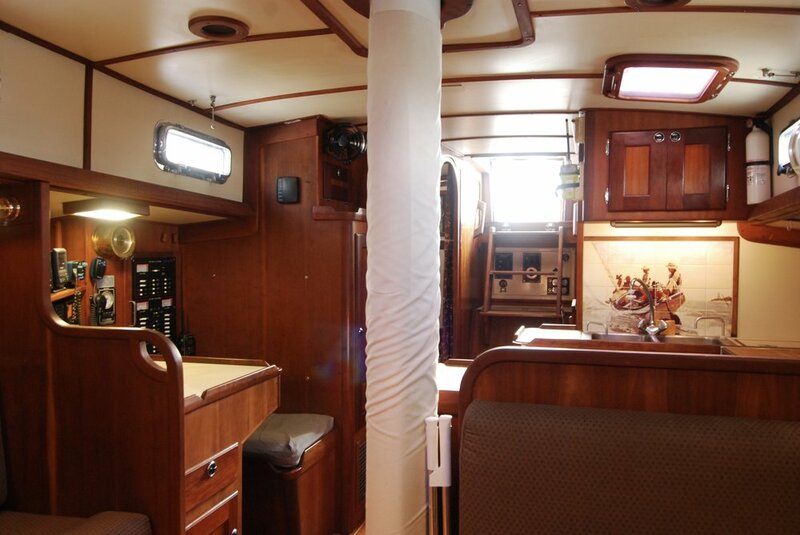 We like that the galley is out of the way of passage through the yacht. The chef does not impede traffic flow through the boat. The head is more like a bathroom with lots of space, the main head has stand-alone shower, good storage, and a high quality toilet. Sails in very good condition and should have many years of life left. They are removed each season, examined/serviced at a loft. Rig is turn-key. 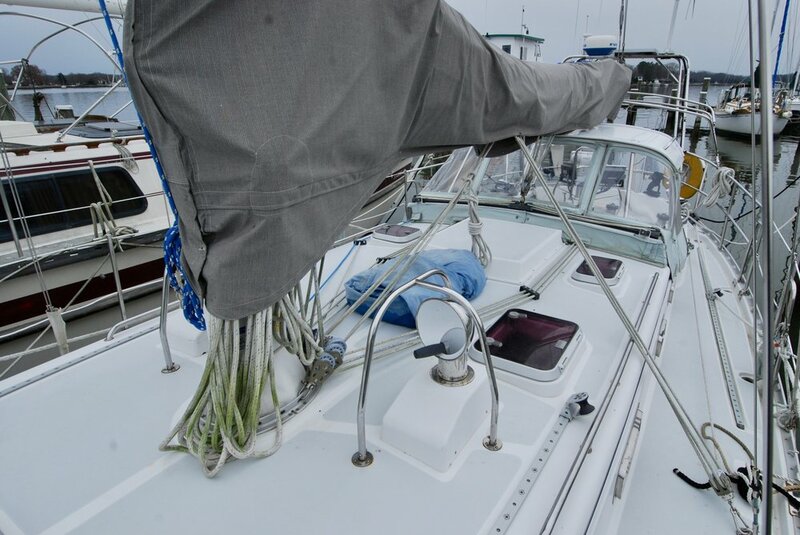 The genoa is furling and staysail is hanked on so you can set the boat for ANY point of sail or wind condition. We were doing over 7 knots knots in a good 15 knot breeze off the wind with a full main and just the staysail with minimum heal. She’s a big boat and doesn’t get pushed around very easily. There’s safety and comfort when you have 35,000 pounds of yacht under you, regardless of sea conditions.